Echoing Team HRC’s success last year in Qatar, Tim Gajser and Evgeny Bobryshev proved they are here to fight for the title. Feeling under the weather today and seemingly struggling in timed practice earlier in the day there was uncertainty as to whether Gajser would be on top form. 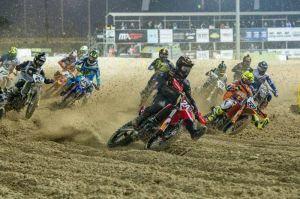 The Slovenian quickly squashed that in qualifying by pulling a holeshot and opening a four second gap between himself and Cairoli in second, for the majority of the race. Bobryshev didn’t have such a good start from the gate but quickly went from eleventh place to fourth within a few corners after some clever passes. His strength was his speed within the second section of the track where he was consistently fast.